Now Taking Reservations For The 2019 Season!! Welcome to Fishmas Charters and thank you for visiting our website. Fishmas Charters is a family-owned business out of Edgewater, Maryland. Edgewater is located about 12.3 miles south of Annapolis, MD and Fishmas Charters calls the Mayo Peninsula home. We cater to the smaller groups of up to 6 passengers and typically fish by trolling or live-lining. Bottom-fishing is also available for perch, spot and croaker. Fishmas Charters operates on weekends and holidays. Children are always welcome! "My Way" is a 42-foot Evans Somerset fishing vessel. She sports two Volvo Penta diesel engines that can power her through the roughest waves with a smooth, comfortable ride. With her 12.5 foot beam, there is plenty of room to bring in a large catch while your friends applaud and snap pictures. The back deck is partially covered to allow for ample shade yet more than enough room for the sun worshippers too. On the hottest of days, feel free to relax a bit in the air conditioned cabin and on those early, Spring mornings we'll turn on the heat to take off the chill. We're excited about "My Way" here at Fishmas Charters and we think you will be too! Stay tuned for her first photo shoot! Crab Charters - Featuring the Full Bushel Guarantee*! 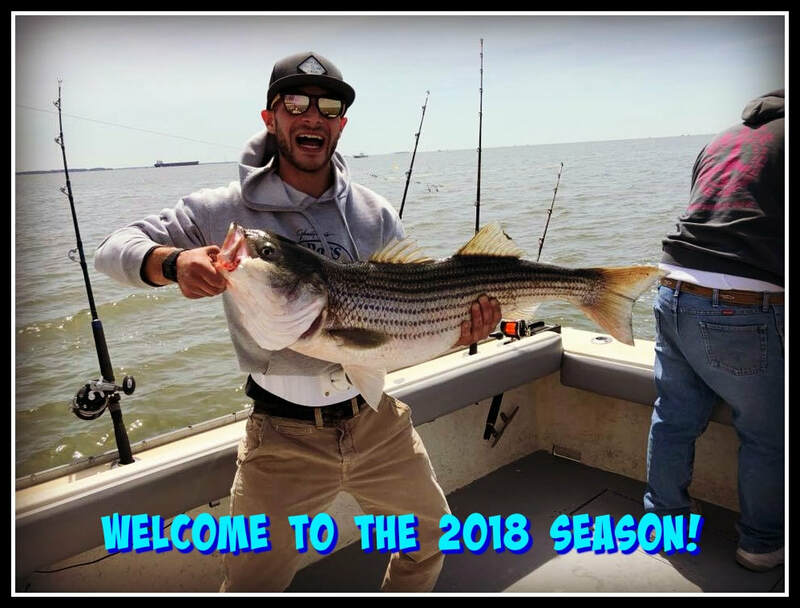 Fishmas Charters are now offering crabbing charters! If you would like to try your hand at crabbing, then look no further than Fishmas Charters. We have the know-how to show you the technique of trotlining and to take you where the crabs are biting...or pinching. This is a great activity for the whole family! Didn't master the art of crabbing? Don't worry! We'll send you home with a full bushel with our exclusive Full Bushel Guarantee*! Call now for your reservation! * Bushels will be topped off courtesy of Big Head Seafood. 'Like' them on Facebook! This offer is currently not available in the month of April 2018 or until further notice due to the cold weather and it's effect on the crabs. Check out the Fishmas Charters blog to keep up with catches and conditions! Fishmas Charters t-shirts are available in sizes L, XL and 2X. Shirts are $15 each. Ask Capt. Mike on your next charter! Available on the boat! 2 fish per person per day between 19"-28" OR 1 fish between 19"-28" and 1 fish over 28"